Augustin Stable’s Utmost denied Tiz a Slam another graded stakes win as he out-finished the favourite in the $175,000 Sky Classic Stakes (Grade 2) on Sunday at Woodbine Racetrack. With the victory, trainer Graham Motion ran his Sky Classic win streak to three and overall total to four. His prior wins in the Grade 2 turf event for older horses were with Can’thelpbelieving (2017), Messi (2016) and Better Talk Now (2006). Tiz a Slam left out in search of his third straight graded stakes win and led all the way to the top of the stretch, setting fractions of :25.43, :50.25, 1:15.29 and 1:40.47 in the race contested over approximately 1-3/8 miles. Meanwhile, Utmost and jockey Alan Garcia tracked in second-place and matched strides with the pacesetter entering the stretch before forging ahead. Tiz a Slam fought on but had to settle for the runner-up role today as Utmost prevailed by one length in 2:17.61 over the ‘good’ course. Seeking Albert edged out Black Sea for third more than nine lengths behind the top two. Garcia said he was confident heading into the stretch that his mount would be able to get the job done. The four-year-old Giant’s Causeway-Fugitive Angel colt was the 9-5 second choice entering the Sky Classic off a game third-place finish in his North American debut in a July 7 turf stakes event over 1-1/2 miles at Delaware Park. He paid $5.60 to win and $2.70 to place. There was no show wagering in the field scratched down to five starters. A two-time winner in England, Utmost now sports three victories and three thirds on his 10-race record with earnings soaring past $180,000. Utmost combined with 4-5 favourite Tiz a Slam ($2.20 to place) for a 6-4 exacta worth $10.60. The 6-4-1 trifecta paid $14.15 and the superfecta of 6-4-1-3 returned $22.85 for $1 tickets. Drumcliff did not finish as his tack slipped during the race and he was pulled up for safety reasons. Tiz a Slam’s stablemate, Danish Dynaformer, was scratched. 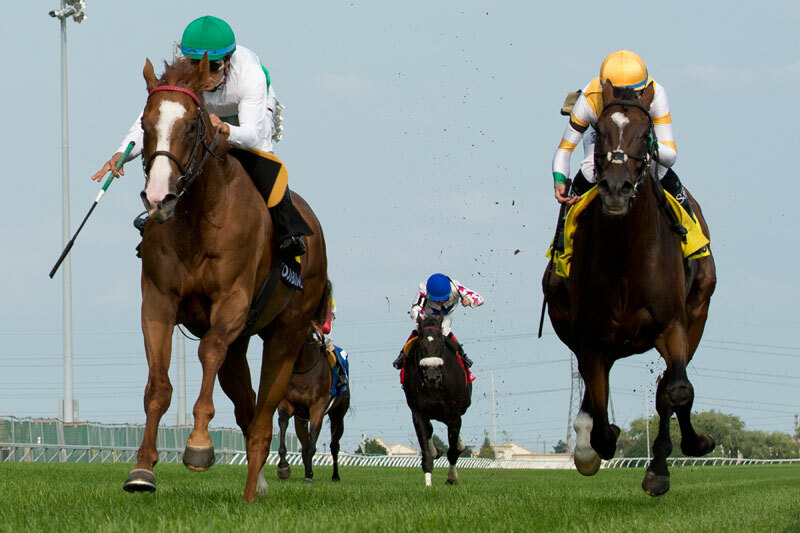 Live Thoroughbred racing continues at Woodbine on Wednesday. First race post time is 6:45 p.m.